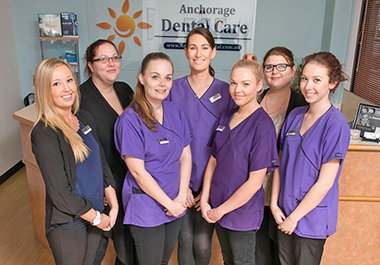 Everyone here at Anchorage Dental Care is here to serve your dental needs! Years ago, if you were fortunate enough to go a dentist, you usually saw a staff of two – the dentist and his/her hygienist. Of course, the hygienist also served as Office Manager, Appointment Setter, Cashier, Chart Updater, Magazine Straightener, Instrument Sterilizer, and performer of every other task that needed to be done around the office. Today’s modern dental clinic has many staff members, each of whom wears a different hat. Practice Manager – Responsible for all administrative functions in the practice and oversees the office staff. This is the doctors right hand person – the one who makes sure that everything from appointments to collections run smoothly. Dental Hygienist – The person in our practice with whom you generally spend the most time! Who else can clean and floss your teeth, check for cavities, administer X-rays, and provide you with the recommendations and education you need to take better care of your teeth and gums? And don’t forget that goody bag your hygienist usually hands you on your way out so that you can maintain that healthy smile! Dental Assistant – The staff member who prepares the room for each patient, takes specific X-rays, makes sure all instruments are present and properly sterilized, and the one who helps the doctor during procedures (i.e., suctioning, rinsing, handing proper instruments). The assistant also updates patient charts during procedures and reassures you that all is well. Our assistants are always one step ahead to make sure we get you in and out of here quickly and provide you with the very best care. Patient Care Coordinator – Our PCC is here to help you with filling out new patient forms, coordinating appointments for your recommended care plan, explaining possible treatment plan options, helping you with budgetary issues, and verifying your insurance benefits. Every one of our staff members is trained and skilled in a particular area of your care. We will greet you every time you walk in the door with a big smile and provide you with knowledgeable and friendly service. At Anchorage Dental Care, we are here to serve your dental needs. Please give us a call to schedule an appointment. We always enjoy seeing your smiling face!